Hundreds of film fans who defied last Saturday's downpour to be at the National Theatre to witness the premiere of the award-winning film, No Time To Die, must have left with the conclusion that the film industry in Ghana is on the verge of another great revival. Featuring a brilliant array of Ghanaian cast, the only non-Ghanaian was a white German who played the only dead man in the film which reminds Ghanaians of the great days when top quality films like King Ampaw's Kukurantumi and Kwaw Ansah's Love Brewed, richly warmed the hearts of movie fans. No Time To Die revolved around Asante, a hearse driver, which role was masterfully played by David Dontoh, and his attempts to get himself a woman to marry. Esi, a young woman, superbly depicted by Agartha Ofori came into the arms of Asante, so to speak, when her mother died and was in search of a hearse to carry the corpse to the village for burial. Asante readily agreed to undertake this task faithfully. On the way, however, Esi convinced Asante to divert the route to visit Kokoroko, the powerful fetish priest, played with delightful zeal by Evans Oma Hunter. Right from the initial contact, it became apparent that the generous Asante and the charming Esi were gravitating towards love. Asante was planning to get close to Esi and show his love in more concrete terms. At the funeral Esi's relatives, particularly her father, played excellently by Kofi Bucknor, could not understand why the hell of a hearse driver, would donate such a huge amount of money at the funeral and also decide to sleep overnight before returning to his base in Accra. Esi was responding positively to Asante's moves. Her yearning to dance at her mother's burial was fulfilled. And what a fantastic Adowa dancer she was. Before the ceremony was over, Esi introduced her aunt to Asante. In fact, this aunt was a business woman from whom Esi had often been getting money. On their way home Asante and his assistant were confronted with a new corpse who had to be transported to Accra. They agreed to assist. Asante planned to visit Esi's aunt to tell her where Esi, a celebrated dancer was performing. Asante's presence at the night club infuriated Esi's manager played by Addokwei Moffat. The manager's bus could not spark and Esi then decided to travel home with Asante. Asante was introduced to the herbalist Kokroko. The deal was for Asante to give to Esi's father two bottles of “a dead man's schnapps” which he collected from the coffin they were sending to Accra. At a family meeting, Esi's father openly opposed the presence of Asante; the old man collapsed and as instructed by Kokroko, Esi's father demanded some schnapps to drink which instantly had a negative influence - he collapsed and fell into coma. Asante, Esi and Asante's assistant had to drive the old man back to Accra. On the way Esi's father woke up from his coma, so to speak. When Esi and Asante saw Esi's father alive, they jumped from the hearse and ran away. One of the most exciting highlights of the film was when Esi's father also jumped from the hearse and chased them to tell and convince them that he was alive and therefore should not be taken for a ghost. This exciting, fascinating movie ended when Esi's father gave his blessing and support for Asante to marry Esi. It is fair to state that this is a product film goers in Ghana will love to watch and watch again. All the cast were professionals and this showed tremendously as the film started ending on this lovely note. King Ampaw has, no doubt, whetted the chronic appetite of Ghanaians to watch a decent first-class film. Wolfgang Panzer, a German and film school mate of King Ampaw's, was the producer. David Dontoh, as the lead actor, spoke volumes of his mastery on both stage and film. The story line is by King Ampaw and Klaus Baederkel. 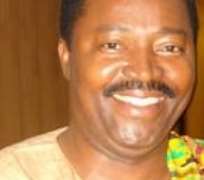 Kofi Middleton-Mends as Asante's boss was classic. Agartha Ofori as Esi was a delight to watch. The production team which was principally Ghanaian, was strengthened with the inclusion of a few Germans. In conclusion one is optimistic that the Film, Television and Theatre Bill will be passed soon to empower Ghanaians show their expertise.